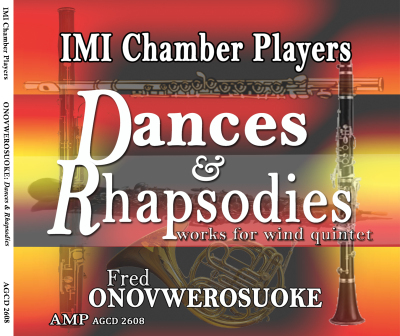 Debut CD by the IMI Chamber Players wind quintet featuring music by African American composer Fred Onovwerosuoke. 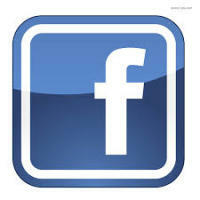 Works on CD include: Four Dances for Wind Quintet, Four More Dances for Wind Quintet, Rhapsody #2 and Rhapsody #3. NOW AVAILABLE at a music store near you, on online at Amazon. Hymes' debut solo cd includes works by Bongani Ndodana-Breen, J.H. Kwabena Nketia, Fred Onovwerosuoke, Justin Tamusuza, and Joshua Uzoigwe. 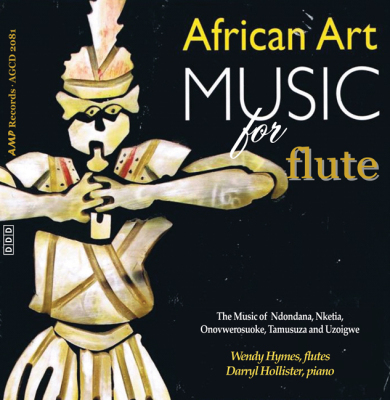 This music offers us a glimpse of the spirit and traditional musics of Africa. The composers’ diverse training backgrounds have led each to connect with different African and Western musics, but each has succeeded in finding their own unique voice and how to connect with diverse audiences on multiple continents. Though written for western instruments using western notation, as in contemporary compositions that employ extended techniques, the performer must familiarize himself/herself with new elements, such as a barrage of polyrhythm, new melodic and harmonic sensibilities as well as the foreign cultural traditions that influenced the composer which are integral to the piece. 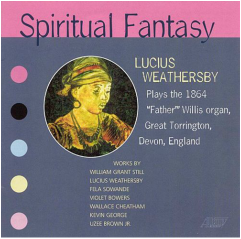 The listener will benefit from reading the background information about the pieces on this CD, including notes from the composers. Inspired by the ancient myth, "Nanna and Ningal," these gorgeous and rich melodies awaken the dream within our soul to express and manifest our love. 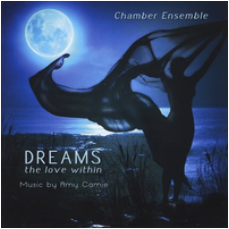 Amy Camie is a spiritual harpist, award winning recording artist, composer, author, spiritual mentor, inspirational speaker and founder of the Scientific Arts Foundation. Professional harpist with 37 years experience managing all aspects of entrepreneurial business. A graduate of Indiana University with extensive solo, orchestral, choral, and chamber ensemble playing experience, she developed a relationship with Inner-Self Stores (owned by Sara Lee) and traveled around the country to promote CDs in each store. As a songwriter and recording artist, she has 10 solo harp CDs and numerous musical CD collaborations. In 2006, she was a Just Plain Folks Music Awards Nominee for Best Solo Instrumental Song, “Expression 3” from A Space Within. Nominated from a field of 25,500 albums and 350,000+ songs. She also created and hosted a talk radio show, “Awaken to YourSelf” for a local radio station and helped developed a medically approved clinical trial exploring the impact of her music on patients receiving chemotherapy.